Being physically active is important to prevent heart disease and stroke, which is the nation's number 1 and number 5 causes of death. The American Heart Association recommends 30 minutes of moderate to vigorous aerobic exercise, five times a week. If you can't get in 30 minutes all at once, you will still experience benefits if you divide your 30 minutes into two or three segments of 10-15 minutes per day. Here are some aerobic exercises to try to improve your health. Go for a walk – Walking is the simplest, positive change that you can make to effectively improve your heart health. Walking is enjoyable to do with friends, with your dog, or even by yourself if you’re looking for some ‘me’ time. What’s nice about walking is you can do it anywhere. Whether its at a mall, on a nice trail, or at the grocery store. A walking program tends to have a high success rate because people can stick with it. 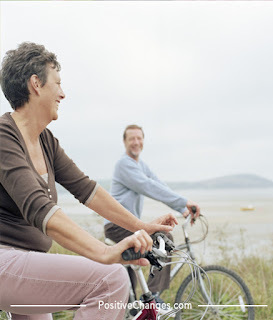 Go for a bike ride – The pumping motion of the large muscles in your legs is a great aerobic exercise for your heart. Either a road bike or a stationary bike will work for this exercise routine. When it's too cold or wet outside to go for a bike ride, a stationary bike is a great alternative. To prevent injury when biking, make sure the position of your bike seat and pedals are property adjusted for your body. Take a swim – Swimming is one of the best aerobic exercises for you. One of the many great advantages of swimming is that it puts less stress on your bones and joints than any other exercise routines. Swimming is especially beneficial if you’re starting out a little overweight or have a joint condition such as arthritis. Go for a spin on the elliptical machine – Elliptical training machines are one of the fastest-growing aerobic exercise options. The advantage of an elliptical machine for heart health is that it gives you both an upper- and lower-body workout…all at the same time. The elliptical leg motion mimics running with the lower impact of cycling. At the same time, the rhythmic arm movements get blood flowing to your back and shoulder muscles. Try Water Aerobics – Like swimming, water aerobics offers the heart-health benefits of a good aerobic exercise workout without causing as much stress on the joints as other exercise routines might. If you have conditions such as arthritis, knee pain, or are overweight, water aerobics may be the perfect exercise for you. Water exercises have been shown to improve the use of joints in people with arthritis without worsening symptoms. Climb Stairs – Whether you choose to climb stairs at home, or at the gym on a stair machine, climbing stairs is an easy way to get your heart rate up. To find your maximum heart rate, subtract your age from 220. If you don’t want to stop to count heartbeats, you can assume that you’re in your target heart rate if you can carry on a conversation while exercising without being too out of breath. Article is adapted from everydayhealth.com.